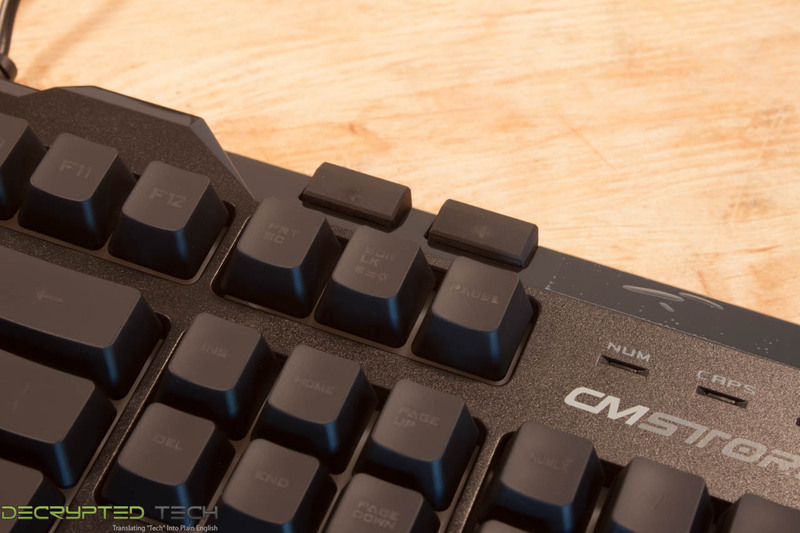 Cooler Master’s CMStorm group has built up a reputation for making good gaming peripherals. Over the years we have seen them put out everything from mechanical keyboards to customizable mice and even gaming headsets. For the most part these offerings have been on the pricier side of the market, but in the recent months they have been working on a more value oriented batch of products. 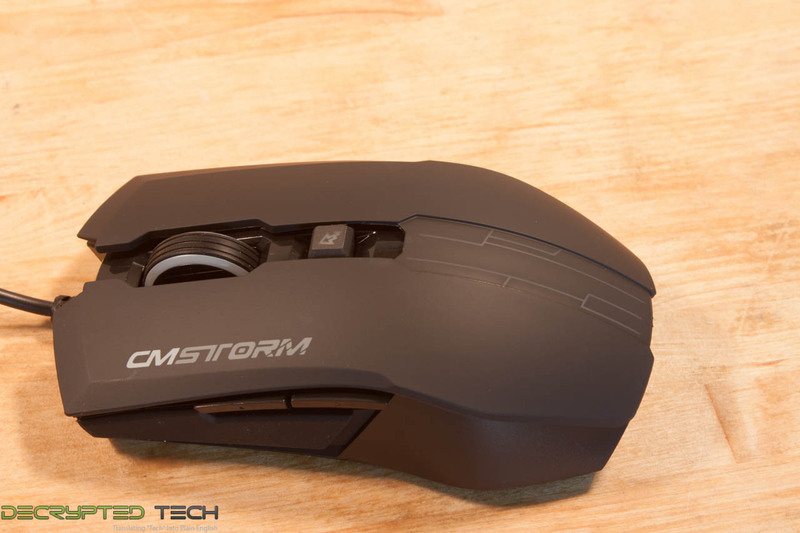 One these (that we happen to have in the lab) is a keyboard and mouse combo, the CMStorm Devastator. Is this combo set really worthy of the CMStorm name? I think we should find out. The devastator box is pretty nice looking even if it is a bit big. The front has the usual image of the product and the back has a list of what you get. We know that most of you do not really care about the packaging or the message that the marketing guys are trying to send. Instead you want to know about what is inside that box, so let’s go ahead and give you what you want. 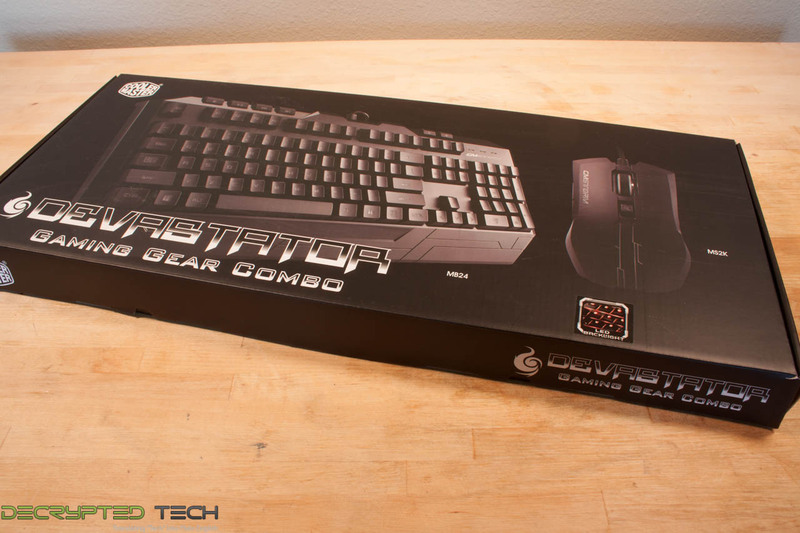 Inside the box (as you might expect) you get the Devastator keyboard and mouse. That is about it. There is some documentation, but that is small enough that most people will simply discard it with the box and be done with it. 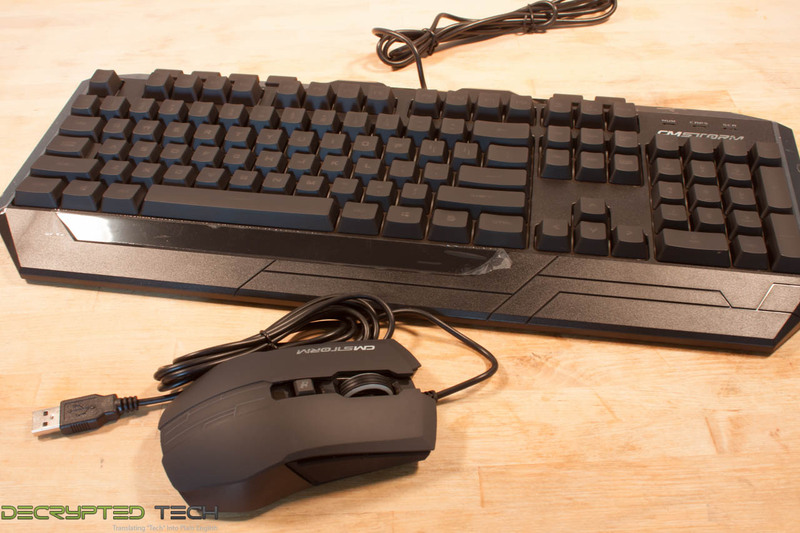 The first thing I noticed about the Devastator keyboard and mouse was how light they were. These were certainly not in the same class as their mechanical keyboards or their stand-alone gaming mice. However I decided to reserve judgment until I had the change to try them out and see if that weight would be a factor in performance. 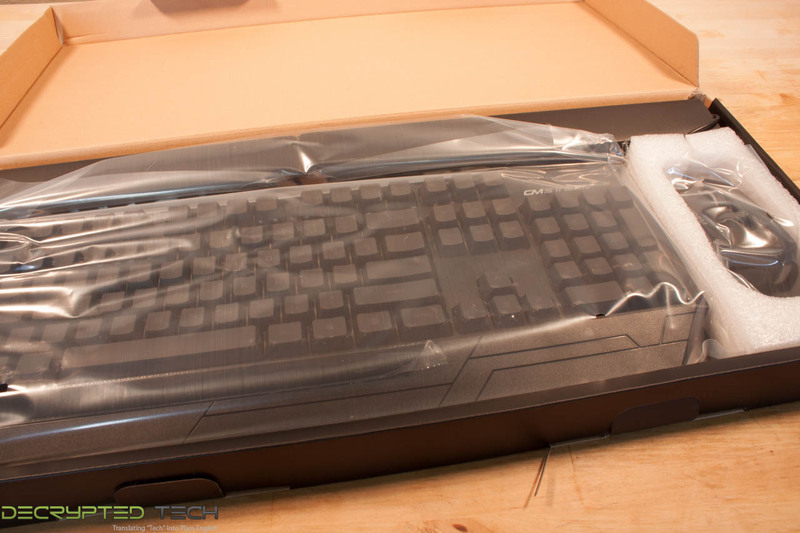 Getting back to the actual overview of the keyboard, the Devastator is a membrane style keyboard (no cherry switches here) that also features full back lighting. According to Cooler Master’s marketing team the membrane used is more advanced than the typical one so you get a cleaner feel and response. This is something that we are certainly going to test when the time comes to see if there is any truth to the claim. 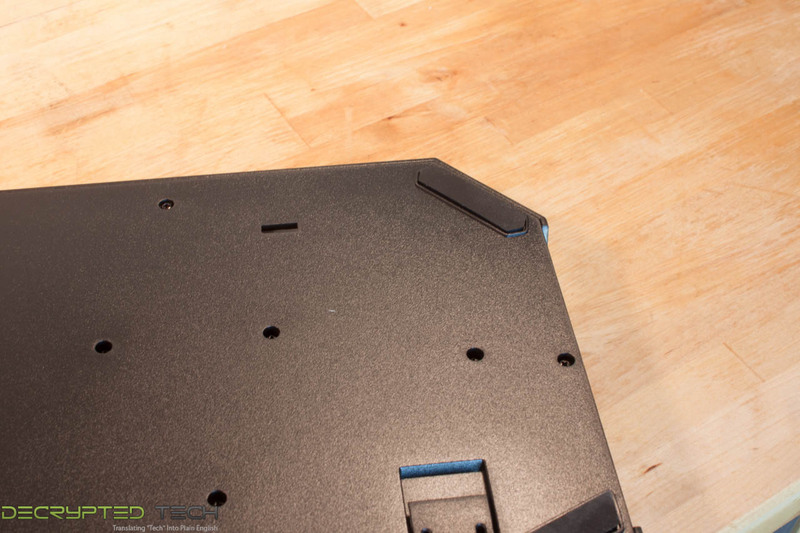 You have your standard QWERTY and Function keys along with the 10-Key number pad all in a very angular base. At the top of the keyboard we find several media keys that control a media player and volume. Oddly enough these keys (well really all the keys) are very difficult to read unless the back light is on. For most people this will not be an issue, but it might be for anyone that does not want the light on all the time. Keeping our eyes on the top of the keyboard we notice something else. The USB cable is hardwired. The connection looks very robust, but in this market removable is almost always going to be better. The cable is not cloth braided either. It is simply the traditional PVC covered USB cable which is not a bad thing just not what we have come to expect. Granted the Devastator is intended as a value product so some of this is very understandable. Flipping the keyboard over, we find smaller than expected pads on the bottom. These are also at an angle. This would seem to me the keyboard more likely to slide front to back than using horizontal pads. 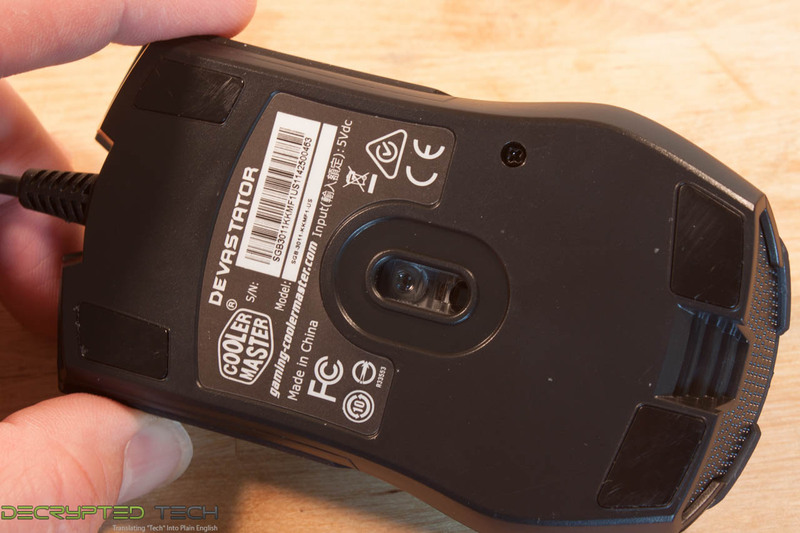 Moving on to the Devastator mouse we again find a surprisingly light product. Most of the gamers we know (myself included) like a heavier mouse. This generally gives you more control as the mouse does not slide too easily over your mousing surface. The Teflon pads on the bottom are also smaller than your average gaming mouse which could indicate less than smooth operation. 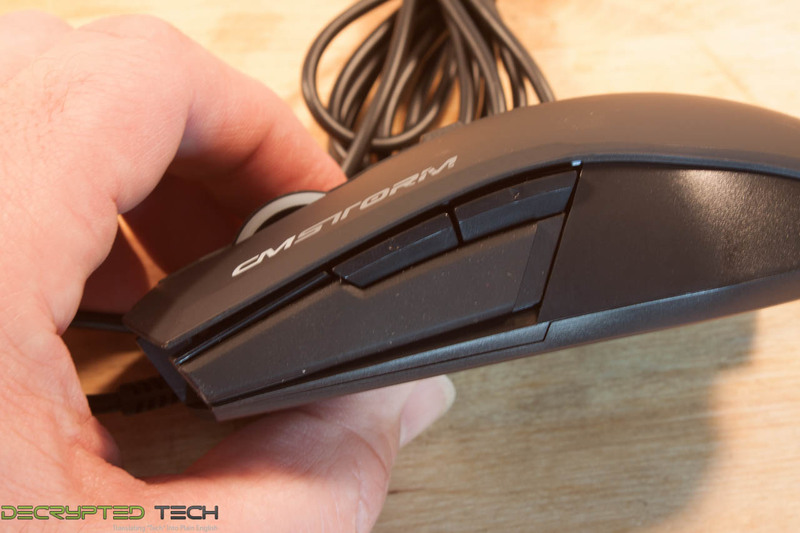 Even with this though the design of the Devastator mouse is clean and comfortable. The long left and right buttons allow your fingers to rest on them easily and the side “pads” add an additional level of comfort if you tend to steer with your fingers and not your palm. Other than the large and friendly buttons there is a wider than normal scroll wheel on the top that has a smooth action. 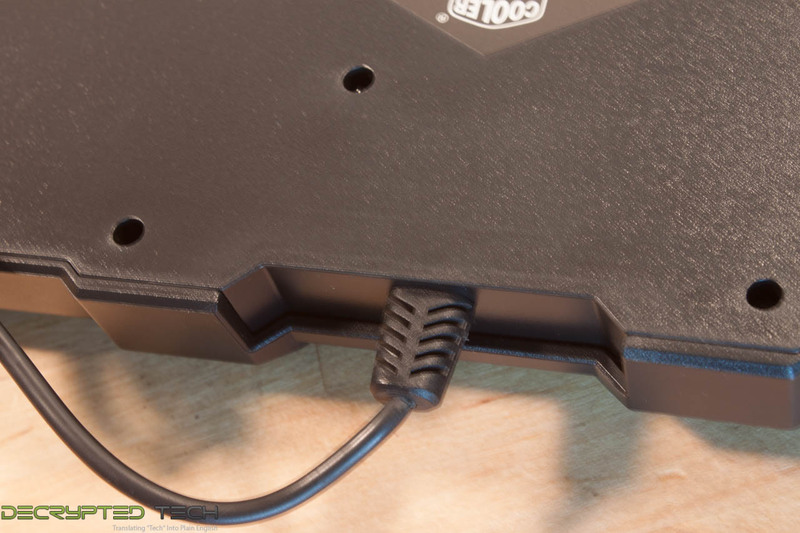 Right behind this is a button that changes the DPI on the laser between 1000, 1600 and 2000 DPI. Like the keyboard the mouse has a standard PVC covered cable. 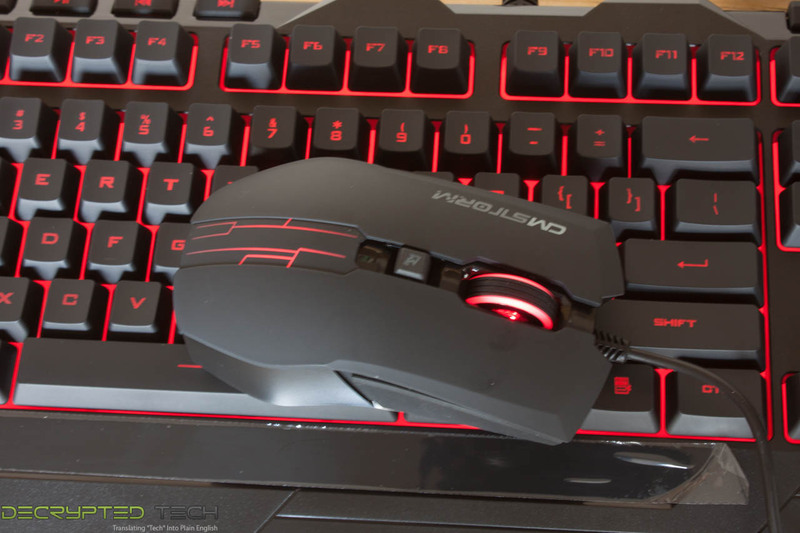 The Devastator comes in a few different colors with the mouse and the keyboard matching each other. The color we received was the traditional red, but you can also get it in blue. The overall feeling of this combo is that they are light and not too stable, we hope that is not the case when I put them to the test with some real gaming and work. Testing the performance of a keyboard is… well different. The only real way to test it is to repeat the same tasks across a range of products and see how each feels when using it. For our testing we like to use the tasks of gaming and writing a document (we typically write part or all of the review on the test board). These two are the most basic tasks that we ask of our keyboards when you come to think about it. We try to perform each task for about an hour and then swap out another keyboard and repeat (this is done three to four times). It is a very long process, but in the end gives us a very good feel for how it performs for us. Sadly this “feel” is subjective and could be different for each person. In our notes below we will indicate if an issue is due to what we are comfortable with or if it is an actual performance issue (like lag etc.). For our gaming test we opted for two recent games, Watch Dogs and Wolfenstein, New Order. Watch Dogs is a third person game that requires a different style of control than the first person Wolfenstein. Our time with the Devastator was not too bad for a membrane based product. Overall the keys felt like squishy black switches or ones that are getting worn out. The key press length was not as deep and the response not as quick, but in general not so bad that it would make gaming an awful experience. The large keys keep your fingers where they are supposed be. The mouse was surprisingly accurate and ease to control despite its light weight. I did find it a little jumpy when running at 2000 DPI, but at 1600 everything fell into place for us. 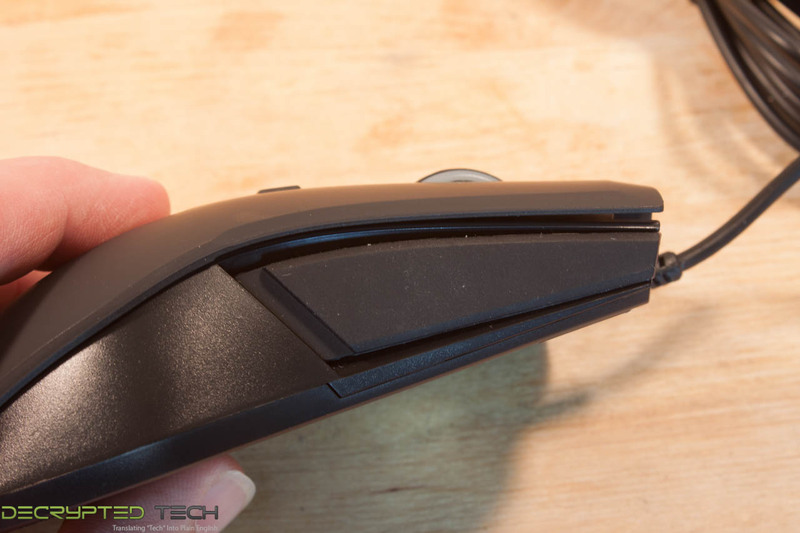 The side finger pads helped enhance my feeling of control over the mouse and did not make it uncomfortable. Typing out documents using the Devastator keyboard was pretty much the same as any other keyboard. 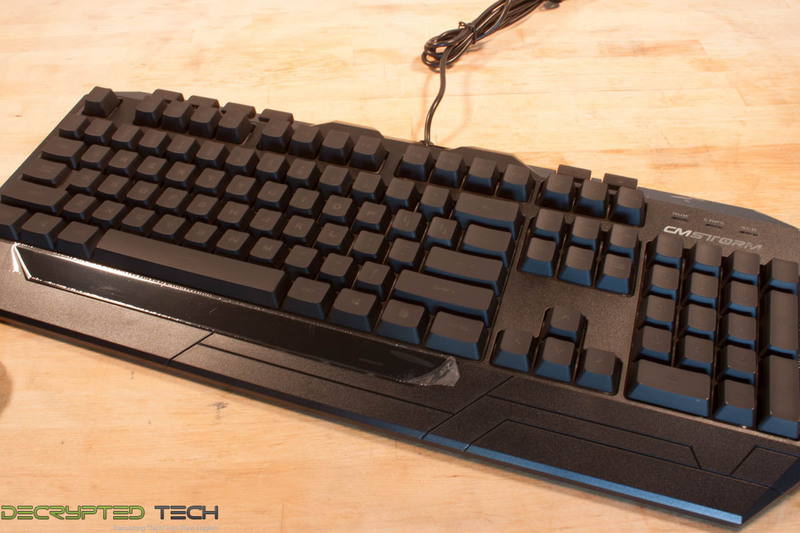 The size of the keys and the length of the throw help to give it a feel like a mechanical keyboard even if it does not have the full effect. Again the mouse is a nice addition despite its weight. It is comfortable to use, although I still prefer to use a claw style mouse. Now a word about lighting. 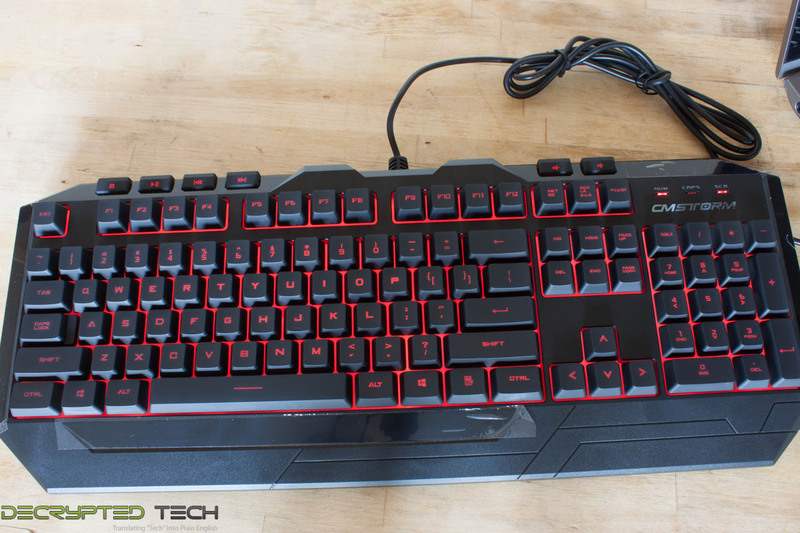 The red back lighting is very nice aesthetically, but to get it to work you have to turn on the scroll lock. 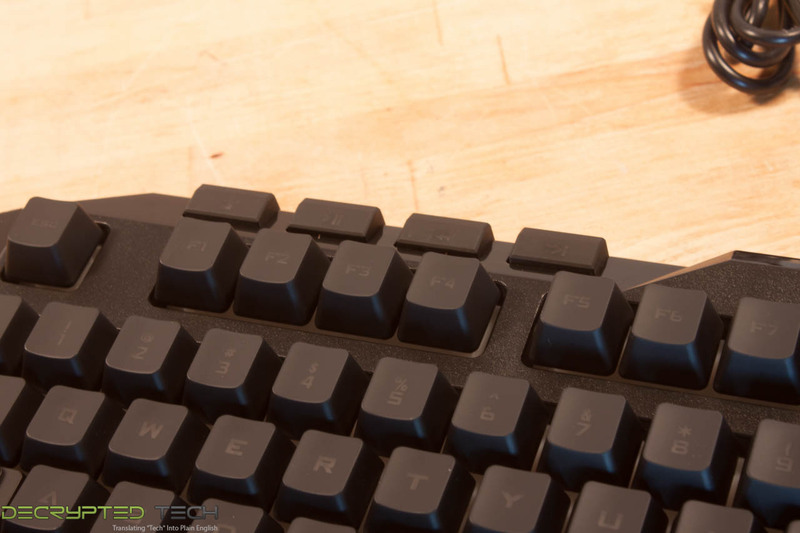 Although scroll lock is not really used anymore it would have been better for Cooler Master to remove the label on the key and simply re-label it instead of leaving it the way it is. On the off chance that some obscure application actually uses or understands the scroll lock there could be some unexpected results. I am not sure who thought that up, but it is more than a little annoying considering the fact that the lettering on the keyboard is very hard to see without the lighting on. Value is another very subjective topic. What is expensive to some might be a deal to others. You can look at this topic in multiple ways. One is raw price and the other is what you get for the money. Each is accurate and both are correct ways to look at price/value. We tend to look at features, performance and real-property when we discuss value. However, we also take into account the raw cash cost of the item. Now… you have read me talking about limitations and potential issues with the Devastator for the last few paragraphs, but in light of the price many of these will fall away based on the fact that it still performs very well for its price point. You can get the Devastator combo pack for just $29.99. That is right both the keyboard and mouse are $29.99 at most online stores. That is an amazing price to get this pair in your house especially if you are on a budget and want to spend more money on other hardware. In the end the price of the Devastator combo pack is what is going to sell it. The level of performance is just a little behind the feel you get from brown or black mechanical switches plus you get full back lighting and a fairly decent mouse to boot. 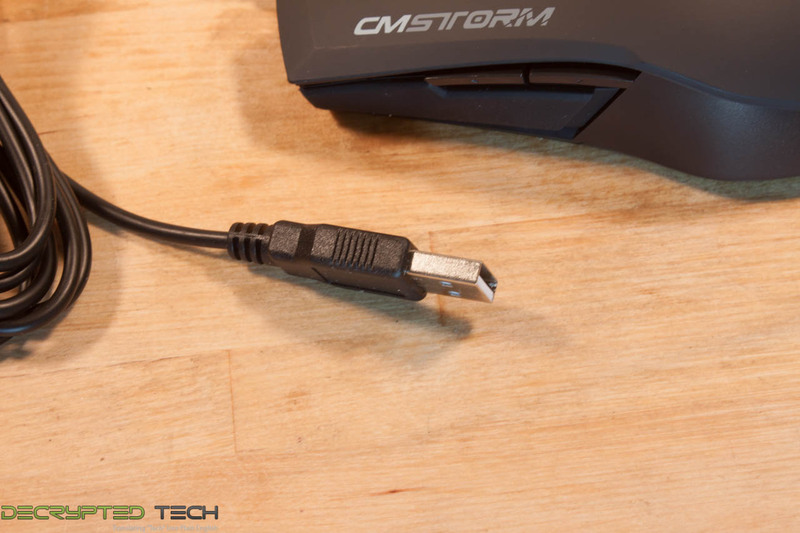 Again, if you are looking to build a gaming system on a shoe string budget then the CMStorm Devastator combo pack should be on your list as you will only have to drop $30 on it to get it in hand. That is could be as much as $100 if you went for a mechanical keyboard and gaming mouse as separates. If you are looking for top end performance, well the Devastator is probably not going to be the product you will want. Where are we now with VR? Is Virtual Reality really the next IT technology?